festival 2012 dates or Hindu festival calendar 2012. Along with the important festivals in 2012 like Diwali, Navratri, Sankranti, Ugadi, Ganesh Chaturthi, Akshay Tritiya, Holi, Shivaratri, Sri Ram Navami, Puri Rathyatra, Varalakshmi Vratham in Shravan month, Raksha Bandhan Rakhi festival, Onam festival, Sri Krishna Janmashtami, other auspicious days dates are also listed here. The festivals are listed as per the monthly calendar. Here is the Hindu festivals calendar 2012. 23 March 2012 Ugadi (Telugu New Year / Kannada New Year). 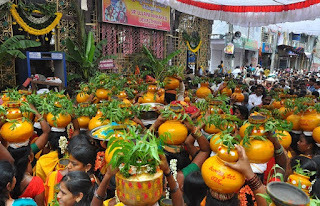 Nandana Naama Samvatsaram starts.